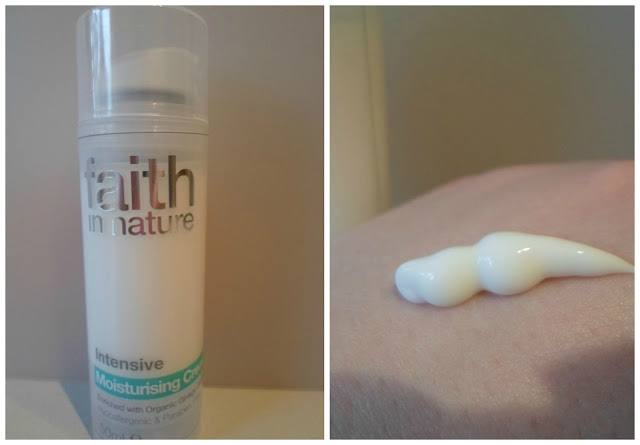 I have been testing Faith in Nature Intensive Moisturising cream. I would say this is a budget buy which will do the job but there are no frills. It’s not as luxurious as Antipodes Rejoice Day cream but if you are strapped for cash, at £6.65 for 50ml I think it’s worth a closer look. I do like the pump packing and it’s one where the platform rises so you are guaranteed to get every drop of product from the tube. The ingredients are good for the price and are adequate for my dry skin. It is not a thick cream which makes it ideal for under make up. I can’t decide if it would be suitable for very dry skin, however that can probably be overcome by adding facial oil to your routine. I am undecided about the fragrance mainly because it seems a little artificial, it reminds me of perfume rather than say lavender or roses. The labelling states “parfum (natural aroma)” so not sure what my senses are picking up on. My other half is happy to use this cream after shaving. He did make a fuss about it leaving a white cast but he was using a large quantity, that’s my view of the situation because when I told him to use less he thought it was better absorbed. The fragrance does not worry him as he has a terrible sense of smell but maybe some men would find it feminine. Overall, it’s a good basic all rounder which I think is worth considering. I can appreciate it won’t be to everyone’s taste and if you like luxury brands you may find it hard to switch over to this. This is the third and last product I have to review from Faith in Nature. Have you enjoyed learning about the brand? Would you be tempted to try something from their wide range of products? Thank you for an interesting review of their face cream. I would be tempted by more Faith in Nature products. I am using their lavender and geranium shampoo and rosemary conditioner. They seem to be doing a great job as my hair is really shiny and stays clean longer. They say they are balancing and rejuvenating. ohhh i may have to pick some up it sounds great ! Good review, does seem like a great bargain buy when cash is a little on the short side.